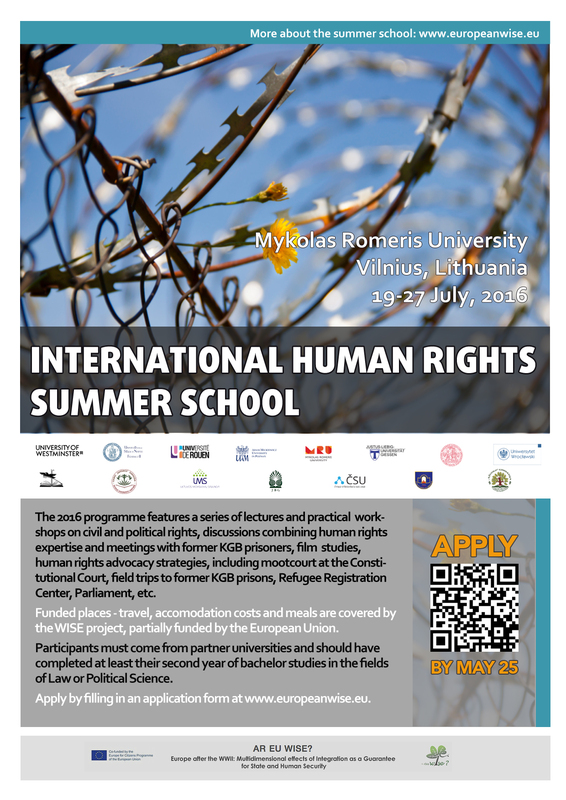 The International Human Rights Summer School at Mykolas Romeris University in Vilnius is a great opportunity for you! The WISE consortium is offering 9 days intensive training (19-27 July 2016) on civil and political rights, including Moot Court competition at the Lithuanian Constitution Court. Study visits in unique places (such as KGB museum, Lithuanian Parliament, Refugees registration center, etc.) are also part of the experience. Do not miss the chance! Apply by the 25th May 2016 on the official website of the Summer School at: http://mruinterpro.wix.com/human-rights#!eligibility-and-fees/c1ylq. Eligibility requirements: students from partner universities that have completed at least their second year of bachelor studies in the fields of Law or Political Science. Expenses. All the costs are covered by the organizers, which includes: shared accommodation, teaching materials, cultural programme, visits to institutions (transport) and museums (tickets), meals (breakfast, lunch and dinner, including opening and closing reception), certificate.